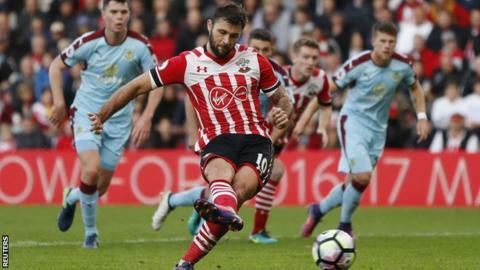 Southampton moved to eighth in the Premier League as goals from Charlie Austin and Nathan Redmond punished Burnley's poor second-half defending. Austin broke the deadlock by poking home at the near post after Virgil van Dijk was allowed to head across the face of the goal from a corner. Burnley's defence was at fault again as Redmond beat Tom Heaton with a low strike from another corner. Austin scored from the spot before a Sam Vokes penalty reduced the arrears. Burnley's defence has crumbled on a number of occasions in the second half of games this season, though it was thanks to a series of fine saves from Heaton that the score remained goalless for as long as it did. The injury to influential midfielder Steven Defour before the break also hampered the visitors' cause against a Southampton side who are now unbeaten in four league matches and still unbeaten at home this season. Southampton, without first-choice full-backs Cedric Soares and Ryan Bertrand, suffered a further defensive set-back early on. Matt Targett, Bertrand's replacement, injured his hamstring - but 21-year-old academy product Sam McQueen came on and performed well. The Saints' defence was organised despite the changes - although they did concede their first goal in 612 minutes of play - and the hosts created plenty of chances, troubling Heaton with 34 shots, the highest total by any team in a Premier League game this season. Southampton had a total of 34 shots in the match. Eleven were saved by Tom Heaton (red), 14 were on target, nine were off target and 11 were blocked. Heaton has made more saves than any goalkeeper in the league - including 11 in this match. His most spectacular of them all arguably came in the fourth minute as he dived low towards the bottom right corner to stop Austin's close-range header. But Burnley were caught out after the break when Van Dijk headed Dusan Tadic's corner towards Austin, who was standing two yards from goal. The former Burnley player needed two attempts, with his first effort blocked on the line by Vokes before he poked in the rebound. Moments after Heaton had made a brilliant save from Tadic, Burnley's defence folded again as Steven Davis' corner found the unmarked Redmond, who fired low beyond Heaton at his near post. The visitors were rattled and it was no surprise that Southampton added to the scoreline, with Austin converting from the spot after Johann Berg Gudmundsson was deemed to have made contact with McQueen. Southampton, particularly impressive in the closing stages as they charged forward in search of a fourth, came close to scoring again on a number of occasions with Davis, Jose Fonte, Jordy Clasie and Jay Rodriguez going close but they could not get past the overworked Heaton. Should Burnley have been awarded a first-half penalty? Sean Dyche's team were unlucky to lose to a controversial 94th-minute winner by Arsenal during their last Premier League outing, but they were unable to frustrate a free-flowing Southampton on this occasion and were fortunate not to suffer a heavier defeat. The visitors had strong cause to appeal for a penalty in the first half after Gudmundsson was felled by Van Dijk but referee Mike Dean, standing yards in front of the challenge, ignored their pleas. Dyche said after the match that it was a decision which could have changed the course of the match. The Burnley manager argued that there was "minimal contact" between Gudmundsson and McQueen for Southampton's penalty. However, it was also questionable whether Tadic's brush with Ben Mee for the visitors' spot-kick should have been punished. Nathan Redmond and Tom Heaton caught the eye but it was Austin who stood out. Not only did the striker score twice from his total of eight shots but he also contributed in defence, making two clearances in an impressive all-around performance. Southampton manager Claude Puel: "I take pleasure this afternoon with a very good second half. It was very interesting to play this game. It was difficult in the first half after the injury of Matt Targett. We lost a little control of the game. "After the injury, we came back with a good intention and situation. I think we could have scored many goals. I'm happy for my players." Burnley boss Sean Dyche: "We should have had a penalty at 0-0, which would make the game different. That's stretching it a bit because they are a very good side but we needed that decision. It's beyond a good shout, it's an impossible decision to get wrong. "They got a very soft penalty, minimal contact if any. But this is not making excuses, they could have scored more, but you need those decisions to go your way. "Southampton are in good form, they break their shape and they are a side to be reckoned with." Southampton are unbeaten in nine Premier League games on home soil (won six, drawn three); a run bettered only by Leicester (19) and Liverpool (10). Charlie Austin has scored seven goals in his last six games in all competitions for Southampton. Southampton had 34 shots (including blocks) against Burnley; their highest total in a Premier League game since 2003-04. Three of the last four Premier League goals conceded by Burnley have been from corners. Since the start of 2015-16, Mike Dean has awarded more penalties than any other referee in the Premier League (19). Southampton have a tough week ahead, visiting Inter Milan in the Europa League on Thursday before visiting Premier League leaders Manchester City next Sunday. Burnley host sixth-placed Everton next Saturday. Match ends, Southampton 3, Burnley 1. Second Half ends, Southampton 3, Burnley 1. Foul by Patrick Bamford (Burnley). Attempt saved. Dusan Tadic (Southampton) header from the centre of the box is saved in the centre of the goal. Assisted by James Ward-Prowse with a cross. Attempt missed. Matthew Lowton (Burnley) right footed shot from outside the box misses to the left following a set piece situation. Michael Kightly (Burnley) wins a free kick on the right wing. Attempt saved. Jay Rodriguez (Southampton) right footed shot from the centre of the box is saved in the top centre of the goal. Assisted by Sam McQueen with a cross. Corner, Southampton. Conceded by Tom Heaton. Attempt saved. James Ward-Prowse (Southampton) right footed shot from outside the box is saved in the bottom right corner. Assisted by Steven Davis. Attempt missed. José Fonte (Southampton) header from the centre of the box is close, but misses to the right. Assisted by Dusan Tadic with a cross following a corner. Substitution, Southampton. James Ward-Prowse replaces Nathan Redmond. Attempt missed. Steven Davis (Southampton) right footed shot from the centre of the box is close, but misses to the left. Attempt missed. Dusan Tadic (Southampton) left footed shot from outside the box is high and wide to the left. Assisted by Jay Rodriguez with a headed pass. Substitution, Burnley. Patrick Bamford replaces George Boyd. Attempt blocked. Jay Rodriguez (Southampton) right footed shot from outside the box is blocked. Assisted by Nathan Redmond. Attempt missed. Oriol Romeu (Southampton) left footed shot from outside the box is too high. Assisted by Steven Davis. Attempt blocked. Nathan Redmond (Southampton) right footed shot from the centre of the box is blocked. Assisted by Steven Davis. Goal! Southampton 3, Burnley 1. Sam Vokes (Burnley) converts the penalty with a right footed shot to the centre of the goal. Penalty conceded by Dusan Tadic (Southampton) after a foul in the penalty area. Penalty Burnley. Ben Mee draws a foul in the penalty area. Corner, Burnley. Conceded by José Fonte. Corner, Burnley. Conceded by Cuco Martina. Substitution, Southampton. Jay Rodriguez replaces Charlie Austin. Substitution, Burnley. Michael Kightly replaces Johann Berg Gudmundsson. Attempt saved. Oriol Romeu (Southampton) right footed shot from outside the box is saved in the centre of the goal. Dean Marney (Burnley) is shown the yellow card for a bad foul. Goal! Southampton 3, Burnley 0. Charlie Austin (Southampton) converts the penalty with a right footed shot to the bottom right corner. Penalty Southampton. Sam McQueen draws a foul in the penalty area. Penalty conceded by Johann Berg Gudmundsson (Burnley) after a foul in the penalty area. Attempt blocked. Steven Davis (Southampton) right footed shot from the centre of the box is blocked.